/ What Are The Best Cauliflower Fry Recipes? What Are The Best Cauliflower Fry Recipes? ​​Improving your lifestyle has something to do with what food you eat. Cauliflower could be one of the best addition to your meal due to the health welfare that it can contribute to your body. But aside from enjoying fitness out of it, you can also have its delightfulness as a food. 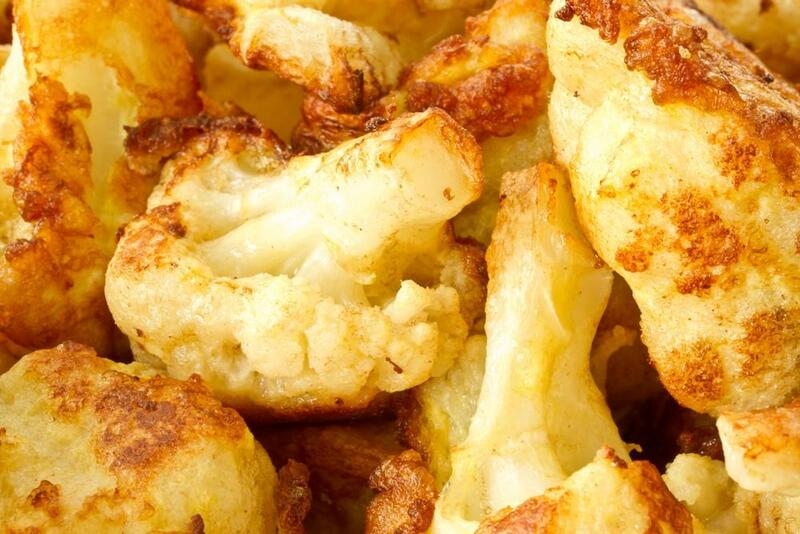 Cauliflower is a vegetable along with the family of cabbage, Brussels sprouts, broccoli, and other related vegetables. This is one of the wonderful and versatile vegetables that could be color green, white and pale orange. 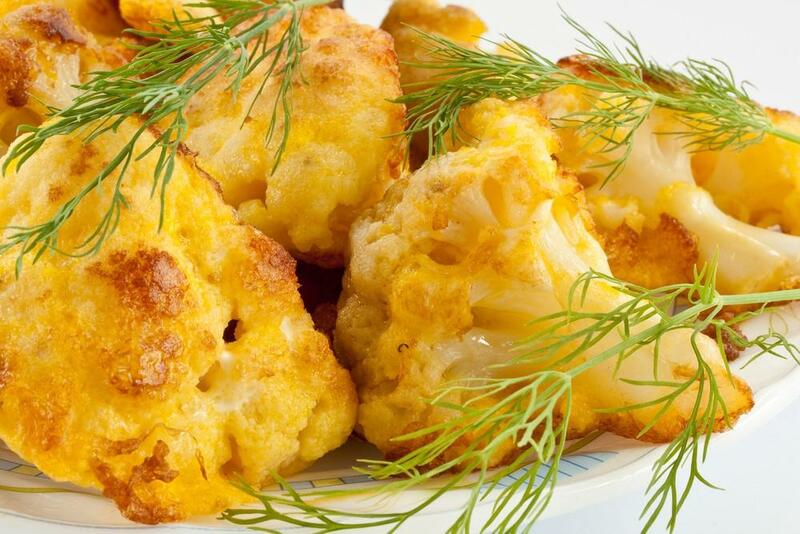 There are several best cauliflower recipes that you could prepare or try. What is cauliflower good for? Recent researches or studies show that the cruciferous veggies or vegetables are mostly the natural source of antioxidants because these vegetables have favorable suppliers of crucial fibers, vitamins, minerals, phenolic compounds and soluble sugars as well as high phytochemical levels. This vegetable is believed to be a largest or huge phenolic compound source. 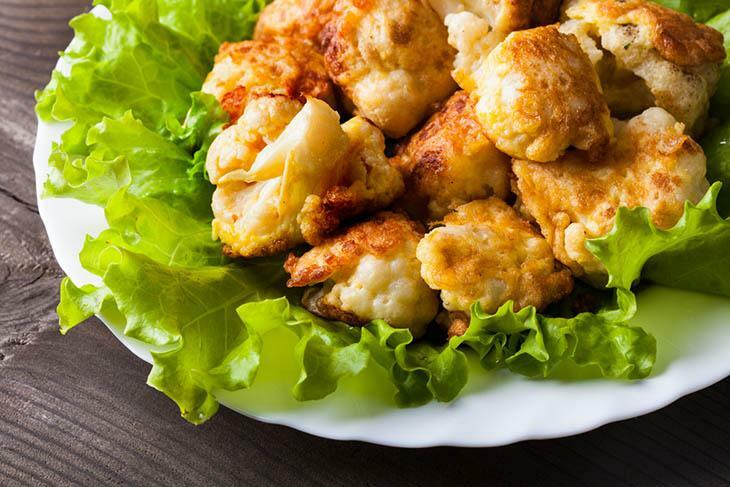 Cauliflower is rich in health stimulating phytochemicals supply, the capability to fight cancer, brain disease, weight gain, heart disease and contains a high level of compounds that are anti-inflammatory. It’s indeed one valuable vegetable. There are boundless of health benefits that this vegetable could provide. This recipe is a family friendly and savory Indian snack that you could prepare using less than five ingredients. Considering that, you could have an easy time preparing this food. You just need to deep fry the florets of the cauliflower. 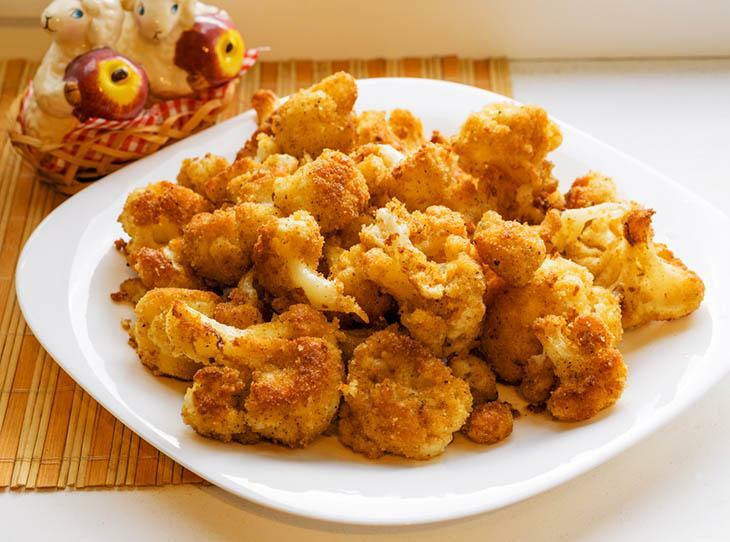 If you have parties at your friend’s house or at your home, this crisp cauliflower fry can be the best side dish addition. 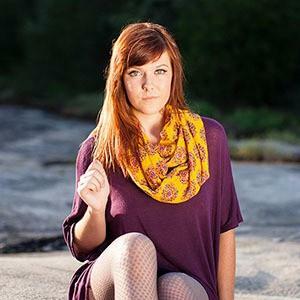 If you’re clueless on how it’s done, don’t worry because we’ll guide you on how to make it. For a start, you must prepare the main ingredients of this recipe, the cauliflower florets, and rice flour. And there you go, you’re now ready to make a simple crispy Cauli-flower fry. 1 - Get a knife and cut the cauliflower into pieces or sizes you can bite. 2 - Then put the bite-sized cauliflower into the water and boil with turmeric and salt. After the flame is turned off, cover the cauliflower pieces for ten to fifteen minutes. 3 - Completely drain the water from the pan. 4 - Get the pieces of cauliflower and put it in a wide vessel. 5 - Afterward, sprinkle corn flour, rice flour, salt and chili powder. 6 - Mix the ingredients thoroughly until the cauliflower is already coated with chili powder. To stick very well, add a bit of water. 7 - Get a pan and heat up the oil on it. Then cook the cauliflower florets with medium flame. Cook it until it reaches crisp and golden brown state. 8 - Serve it hot. 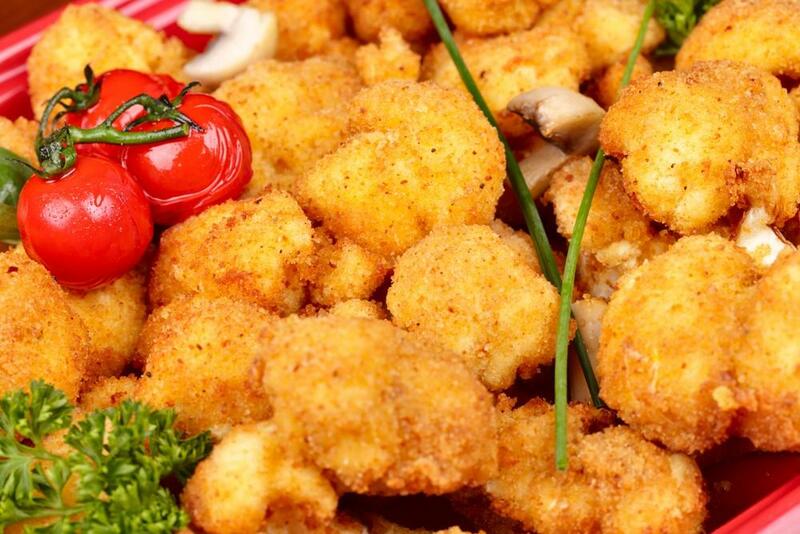 This is another cauliflower fry recipe that you’d love to have on your table. It’s also fast and easy to prepare. You’re done cooking within five minutes and will completely have it for about ten minutes. 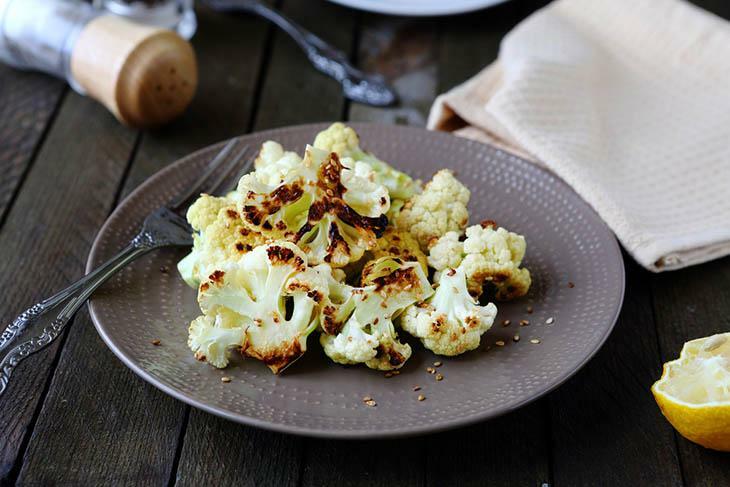 1 - Get the cauliflower and break it up into a large portion of florets. 2 - With the use of your hand, make those florets small. 4 - Heat a large pan with medium high up to high heat. 5 - Add oil. Afterward, add the salt and cauliflower. 6 - Continuously stir the cauliflower on the pan until some of its areas turn very brown. Know how to do it here. 7 - Do this for about three minutes. After that, turn the heat to a low level. 8 - Add the juice of the squeezed lime and soy sauce. 9 - Also, add the green onions (sliced) but reserve some of it for the finishing serving. 10 - Stir the ingredients and cook it for about a minute. 11 - Get the hot sauce and squeeze it over your cauliflower. 12 - Continuously stir until you observed that the sauce is completely incorporated. 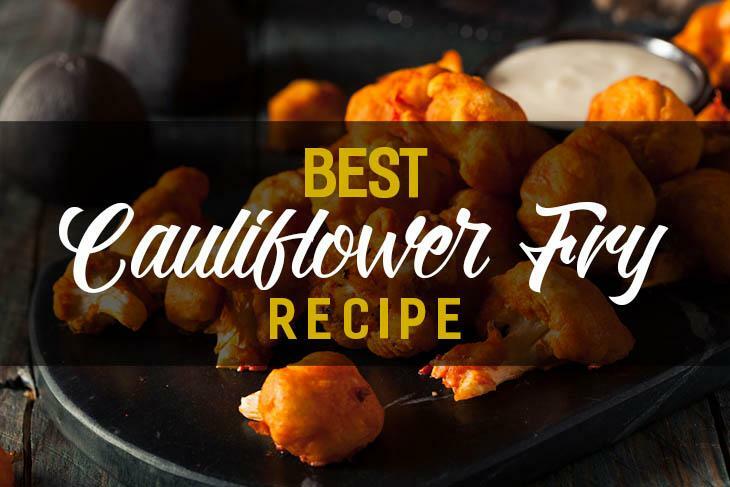 **Note: If you want a flavorful and colorful cauliflower fry, you add more hot sauce. 13 - Put the cooked cauliflower fry in a bowl then get the reserved green onions on its top. 14 - Serve this with the lime wedge. 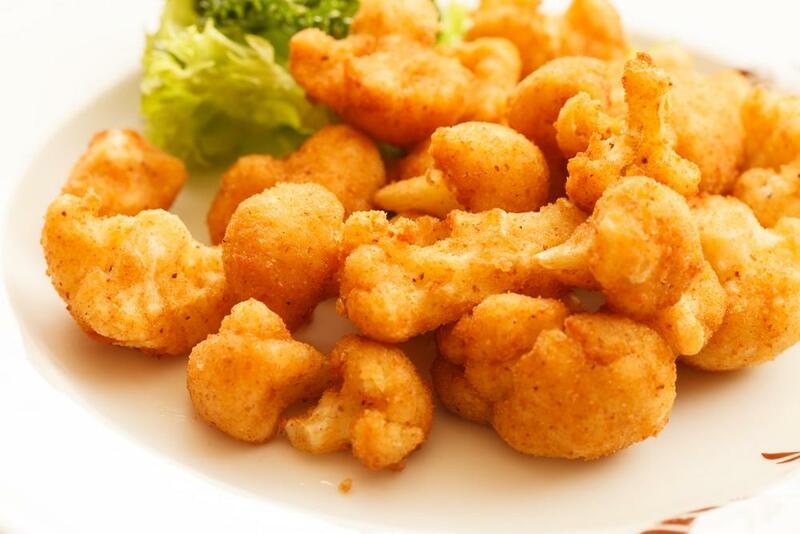 For simpler, more delicious and healthier meal, Pan Fried Cauliflower florets are one of the favorable recipes to try. The cauliflower flavor comes through compared to other cauliflower fry recipes. Aside from that, it’s an awesomely quick recipe to make. To create four to six servings, you will just consume 20 to 30 minutes of your time. The inclusion of the following is optional: chili powder, cayenne pepper or any other ground pepper. If you’ve used a larger cauliflower, there’s a need for you to add up other ingredients such as egg, milk, flour and other mentioned ingredients. 1 - Cook the entire cauliflower (whole) first. Don’t divide it into cauliflower florets. Bear in mind that you will still cook it further so don’t overcook it. 2 - After you’re done cooking it, rinse the cauliflower with cold water. When it’s cooled down, chop it into chunks or quarters. 3 - Separate the cauliflower florets from every cauliflower quarter. 4 - Get two small containers designated for the batter. Altogether, mix the milk, salt, and egg. In the other bowl or container, blend the black pepper and flour well. If you’re a lover of spice, you can add chili powder. 5 - In the egg mixture, dip each of the florets of cauliflower. Afterward, deep it and coat it well with flour mixture. Set those coated cauliflowers aside. 6 - In a pan, put the battered cauliflower and fry it in batches. You will need less or more oil depending on the size or type of pan you have. 7 - In frying the cauliflower, place each piece in a pan flat and side down. Leave the cauliflower pieces for two minutes. In flipping the pieces, make use of tong. 8 - Cook until it turned brown. 9 - After you cooked the flower florets, drain it on a paper towel. 10 - Serve the pieces of cauliflower pieces while it’s hot and fresh. This is why when you have a left cauliflower fry leftover, it will be best to reheat it. When winter comes, your friends, family members and you, mostly search for stews and other hot or spicy foods for your taste buds. 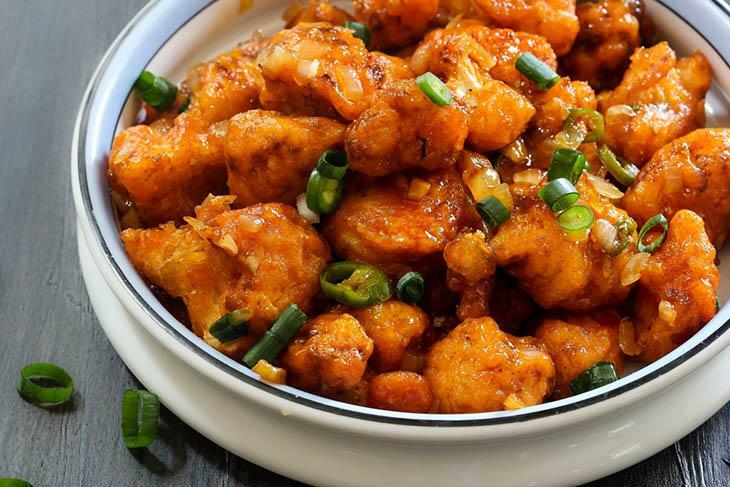 If you want simple preparation with a great kick on your tongue, this simple spicy fried cauliflower will make your meal extraordinary. You might get addicted to it as well. This simple yet spicy cauliflower fry becomes amazing food when it’s dipped in a spicy batter that is gluten free before it is fried. The mixture for dipping contains corn flour, egg, and milk. These ingredients are being mixed smoothly together to achieve favorable mixture. Moreover, it’s spiced up with a little of black pepper, cumin as well as coriander seeds. This recipe could be cooked and prepared for 20 minutes, 5 minutes preparation time and 15 minutes cooking time. 1 - Whisk the milk and egg. 2 - Next, add the cornflour and thoroughly mix it. 3 - Mix the spices and blend or stir it well. 4 - Set the mixture aside. 5 - In your frying pan, heat the sunflower oil. 6 - Then, dip the cauliflower pieces into the created spicy batter. 7 - Put the dipped cauliflower into the pan carefully. 8 - Occasionally flip it. 9 - For removal of excess oil in the cauliflower, get a paper towel and put it there. 10 - You can serve this cold or warm with the perfect addition of yogurt. You can, in fact, freeze cauliflower. 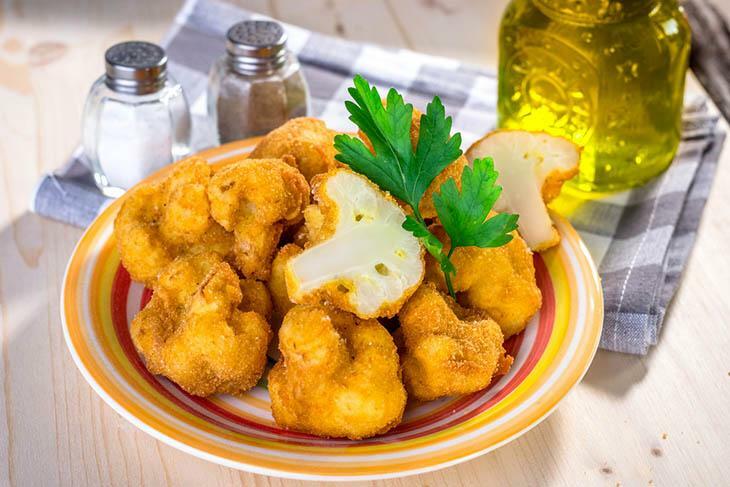 When you’re on the market searching for this vegetable, you should look for cauliflowers with firm heads without soft yellow or brown spots on its surface. Before cooking it, place it first in a large bowl (a cold salt water) in an upside down position for fifteen minutes. Through this, you’ll make sure that harmful pesticides or insects have been removed. In any meal, the choice of cauliflower is a wise one. Even better, if you have an hot air fryer on you kitchen, you can prepare some amazing deep fried like cauliflower chips. With is continual availability and mild flavor, it’s a perfect match or side dish in your any meal. It also possess lots of health benefits. Cooking and preparing this vegetable is very easy. Chef or even the newbies in cooking can freely experiment on how to prepare and make this food more flavorful. If you have further questions or ideas to share, just leave your comments below. You might also like : What Is Chicken Base And How To Make One?